Pierate - Pie Reviews: British Pie Awards 2017 - Live! The day of the British Pie Awards has arrived! Held in the heart of pork pie country - Melton Mowbray - the scene is once again set for around 100 judges to rate well over 800 pies from across Britain and beyond! Of course you won't be surprised to know we've been invited again this year - having been a judge, media or helper at the British Pie Awards since 2013 - and this year we're there as media to give you the inside scoop of what takes place - Live! As well as looking forward to seeing lots of our pie friends at the Awards, we hope to catch up with our com-pie-tition winners during and after the Awards to share our ex-pie-tese, as while the British Pie Awards use a significantly different set of criteria to us (rather than the 7 Cs of pie rating that we have used to rate almost 600 pies on Pierate) there are very few pie experts with more ex-pie-rience than us when it comes to the pie-fect pie! So check back here during the day for live blog posts below and on Twitter and we hope you enjoy hearing about the British Pie Awards 2017! 8.00 - It's been another early start for Pierateer Rob but he is now on his way to Melton Mowbray for the British Pie Awards 2017! Having done this journey a number of times now, we know the signal on the train is a bit intermittent at best, so we'll keep you posted when we can but normal service will resume when we arrive in Melton Mowbray around 9:40! 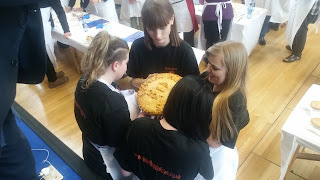 - The Sisterhood of Pies - In case you didn't hear, we ran a com-pie-tition to find a pie judge (as Sam & Tim couldn't make it) & it was won by Anya, Charlie, Jessica and Katie. Check the blurb at the top for details of their pie blog too! 9.00 Nik Speller is a freelancer who we've met a number of times at the Pie Awards but first met in London for a pie meet up. He became our test student for our "Pierateer in Training" programme! Kate (aka #AwayDayPieGirl) is a new follower of the @pierateers twitter feed (link at bottom of this page!) who tries the pies at away football games for Telford United. Was great to meet her at our Birmingham Pie Night on Monday! 9.15 Felicity Spector is Deputy Programme Editor for Channel 4 News and loves food & writing about it! If you cross out the deputy news editor bit, we pretty much do the same job! Love reading her food tweets. Megan and the Wild West Comms team do a great job of promoting the Pie Awards every year. Thanks for sorting our media passes! 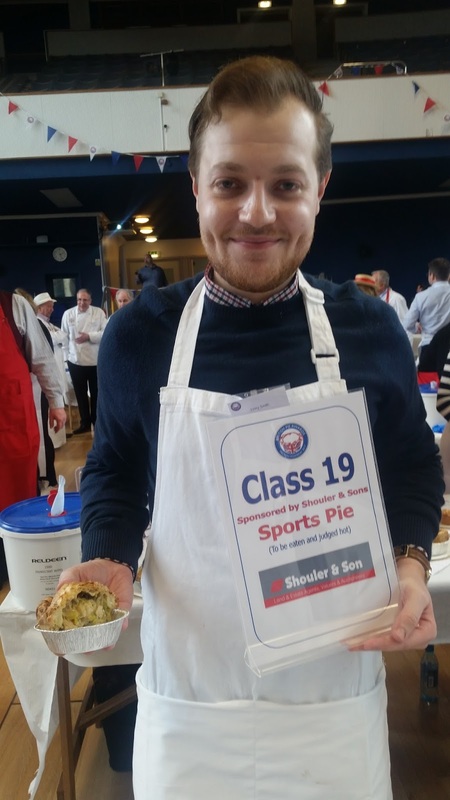 9.30 The Pie Pundit himself Jonny Smith - who has like us been in National Newspapers talking football pies! Andy Clarke - TV star and self confessed food and drink loving TV producer! 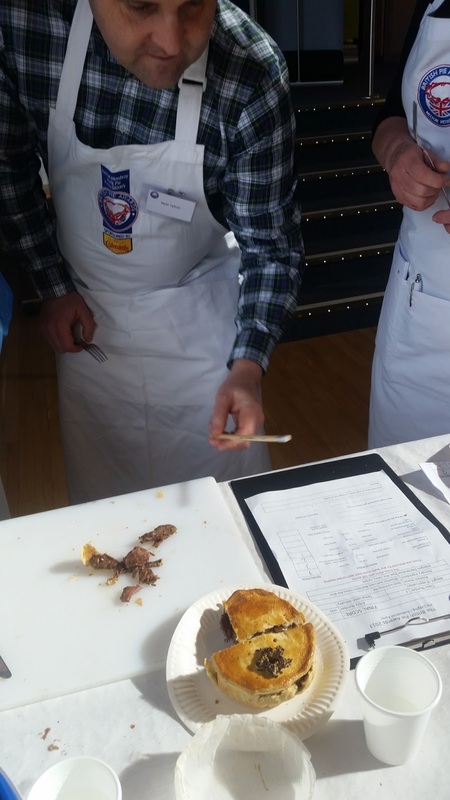 Mr Martin Tarbuck - author of "The life of Pies" and a pie rater who's just as passionate as us! Jamie from butchr.net - who is judging and blogging today! 10.05 So we've arrived in Melton Mowbray, met Nik and some pie fans over in MM from Australia and I'm just having breakfast... an apple pie of course! 10.30 We've arrived at the venue, grabbed our media pass and are meeting some of the judges! 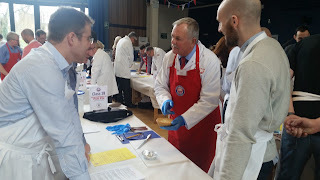 10.50 Great to meet Phil Vickery, who is the celeb pie judge today and filming with Good Morning TV show! 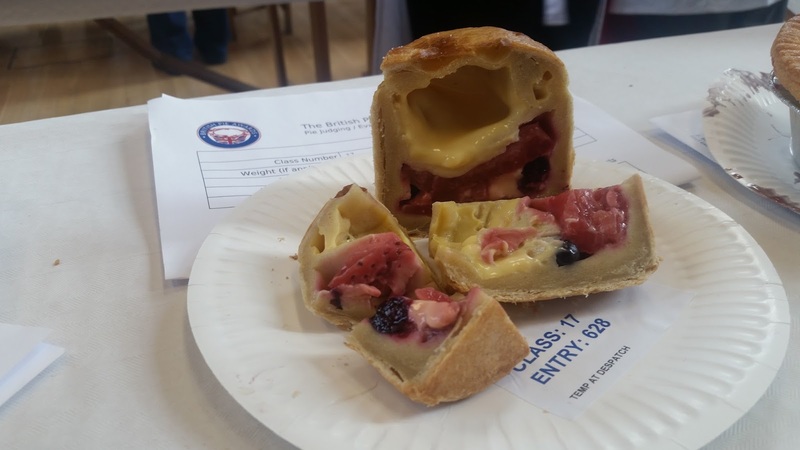 11.00 Time for Matthew, Stephen and head judge Ian to meet with the class leaders to discuss pie judging! 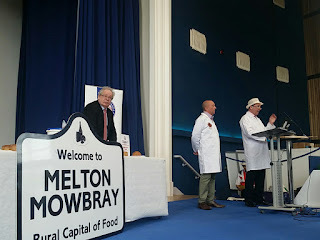 11.30 Matthew from the Melton Mowbray Pork Pie Association has informed us that, now in its 9th year, the Pie Awards judges have rated over 7,000 pies! After doing his best air steward impression he thanked everyone for coming and told everyone to enjoy the pies!!! 11.35 The Reverend Kevin Ashby (whose church normally hosts the pie awards but is being renovated this year) gave us a pie prayer of blessing to thank God and all the bakers for these wonderful pies! Amen to that! 11.40 Let the pie judging begin!!! 12.00 Love the busy murmour of a hundred people eating pies and rating them! Here's pie judge & Channel 4 News Deputy Editor Felicity Spector (right). 12.15 Have been speaking to Louise, Tim and Tom on the "Beef and any flavour" class. Some combos have worked but the Italian Meatball pie didn't rate so highly! Couple of DQs for being too heavy too! 12.45 Martin Tarbuck, pie rating author of "The life of pies", is in the Steak & Kidney class. He says "We've had some good pies but waiting for one to blow me away!" 12.50 We've had a chat with Rev Kevin Ashby - whose church St Marys in Melton Mowbray normally hosts the awards. It's under renovation this year but he assures me the pie awards will be back in their rightful place next year! And with new floor, power sockets and PA it should be even better at hosting the awards then! 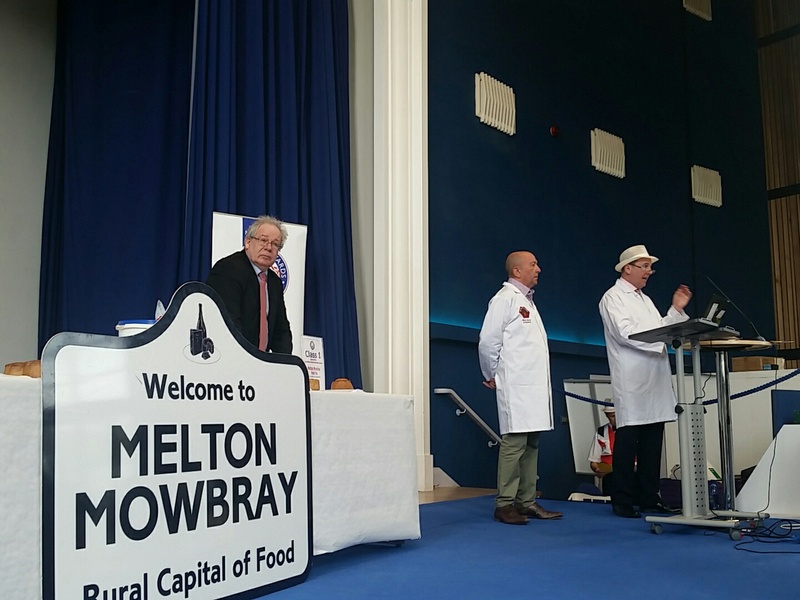 13:15 I've been speaking to the Chairman of the Melton Mowbray Pork Pie Association Matthew. He was the one who founded the awards and is delighted with the record number of small pie producers who have entered this year! This Saturday there will be a festival of pies in Melton Mowbray town centre market too and we'll be back in July for "Piefest" - where we'll be talking about how to rate a pie! 13.30 Lots of interesting dessert pies, including this Rhubarb and Custard effort! 14.00 While some classes are starting to wind down a bit, there's still plenty of pies to rate! 14.05 Our com-pie-tition winners "Sisterhood of the travelling pies" have been posing with pies! 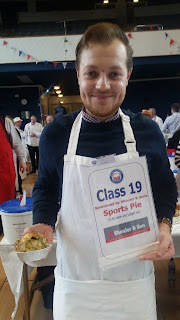 14.30 The Pie Pundit aka Jonny Smith was unsurprisingly on the sports pies! 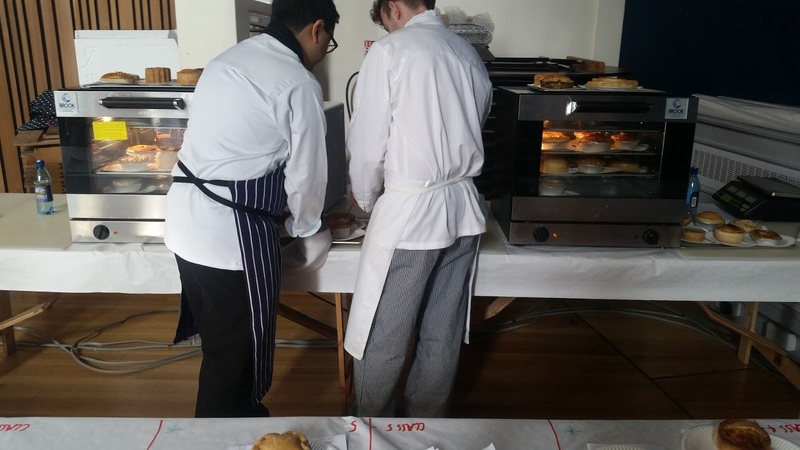 He had some surprisingly fillings including an apple pie and lamb pie, but lots of steak! Though he commented on the lack of hand held options. 15.00 Well there we have it! The ovens are off, the tables are being wiped down. Good times have been had. Now just to wait til Friday to find out the results! Thanks for stopping by for photos of pie!!! 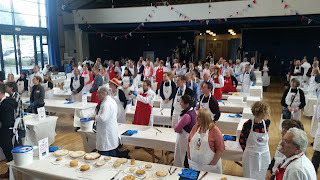 The winners at the British Pie Awards will be announced on Friday 10th March on the @BritishPies twitter feed and updated on the British Pie Awards website. 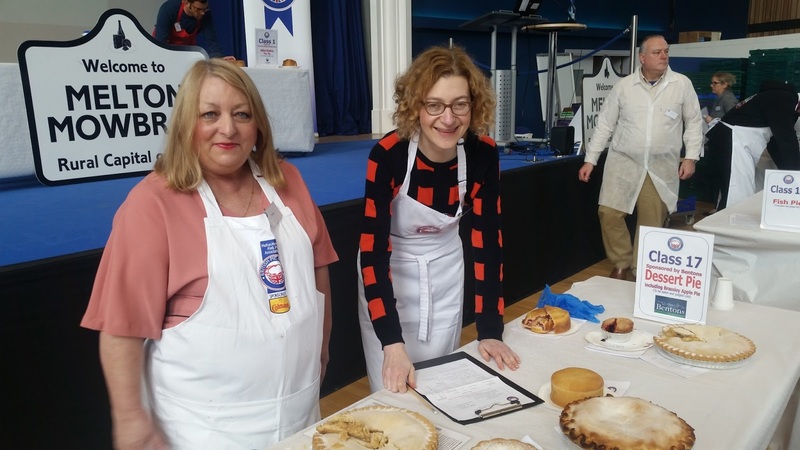 If you want to find out more about the British Pie Awards 2017, check out our Countdown to the British Pie Awards article. Did you know? 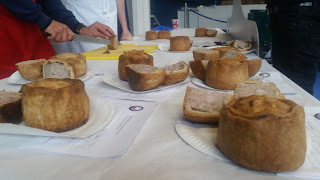 This is the second time that the British Pie Awards are happening in British Pie Week, following a successful but controversial first time out last year! 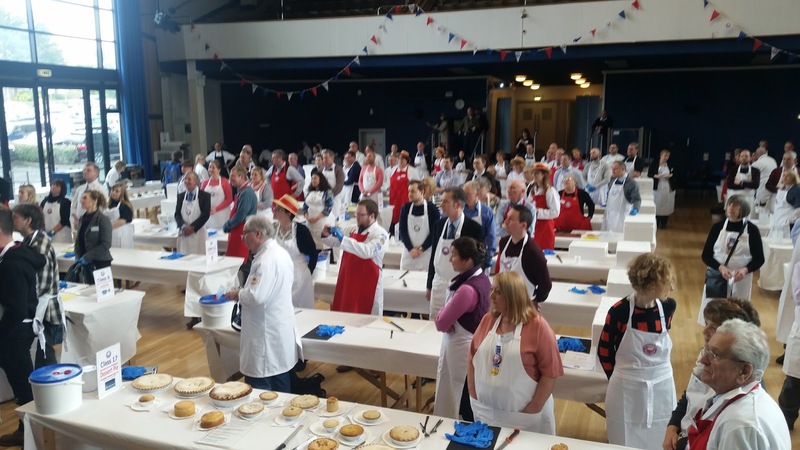 You can read about the controversial winner in our British Pie Awards 2016 article and find out Everything you need to know about British Pie Week here! Look forward to seeing you there, good luck to all entrants!